For our current study we can suffice with simple systematics. Horses come in three kinds: with or without stripes and donkeys. 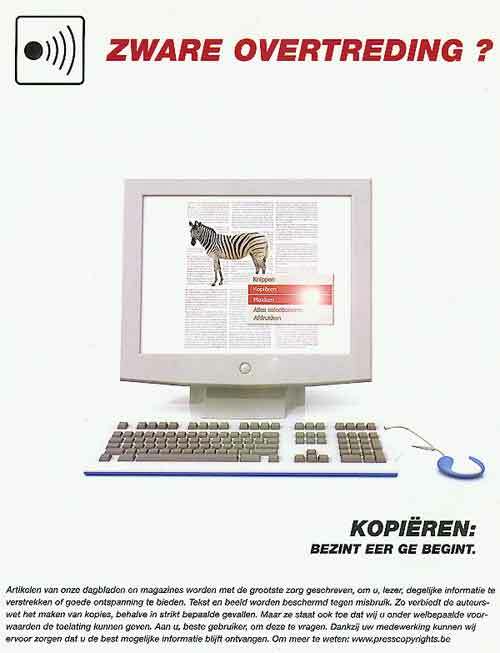 Zebras are surprisingly often used in copy-related situations. They do warn us against imitation or illegal copying. They also advertise colour copiers. 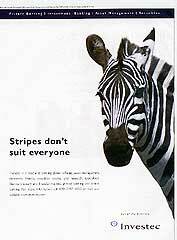 Zebras carry stripes; a fact that is noticed by many copywriters who cannot withstand the witty ideas popping up. 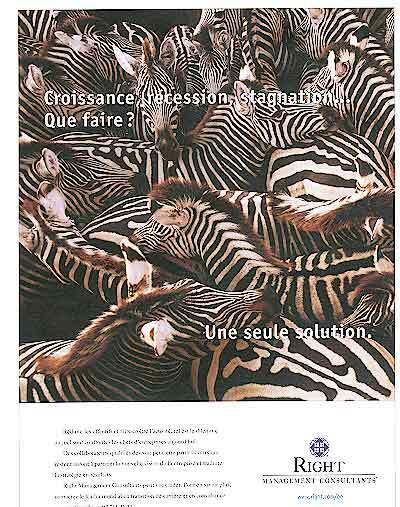 Zebras tend to live in herds and this is the background of quite some advertisements where any species with the same behaviour could have been used. 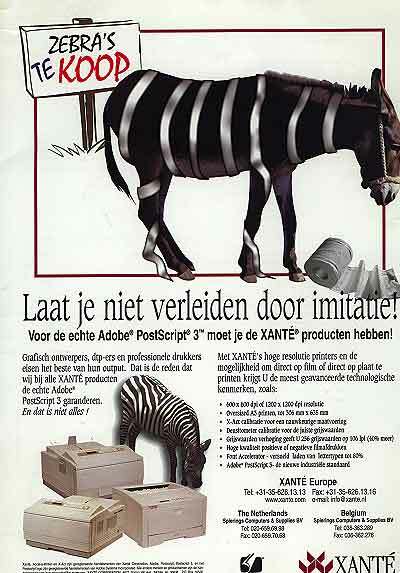 The Zebras of our first examples (ad 1, 2) - both about printers - are shown in a context of imitation, or second rate products. We are told that the market leader is better than any me-too and that we should stay away from any such printer. In both situations the original first class product is impersonated by a Zebra. I wonder why. I can't find any sound reason why it had to be a Zebra. The species was probably chosen just by chance. That is even more true in the third example where we are educated about the author's copyright which is all too often conveniently forgotten. A better choice, in my opinion, would have been a parrot which is indeed shown in an advert about copy protection of software. 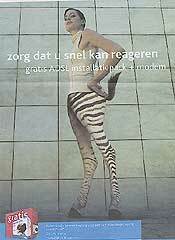 Our next Zebra advertisements (ad 4, 5) are also copy-related. 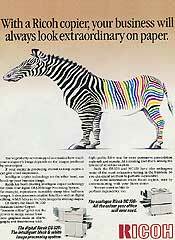 The black & white and colour range of copiers are represented by the black & white and coloured half of a Zebra. 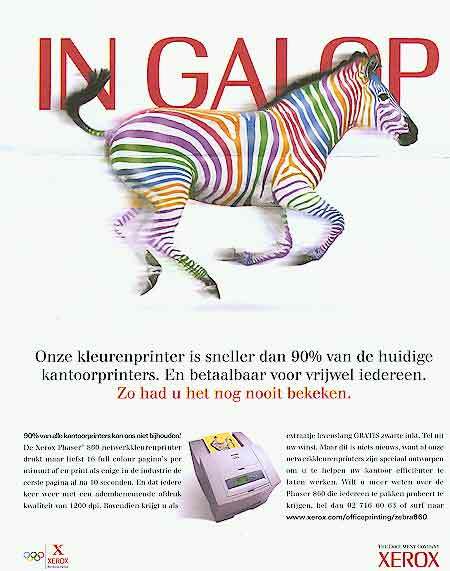 The Zebra of ad 5 was given colours because he is selling a colour printer and gallopping because the printer is extremely fast. 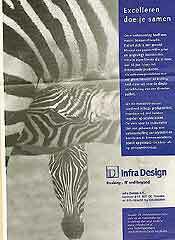 We have an advertisement for carbon-less multicopy colour forms where Zebra fish are doing the work. 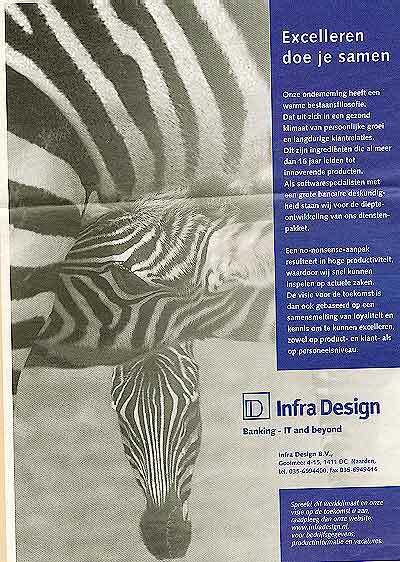 There must be some connection between Zebras and copy and colour but I fail to see it. 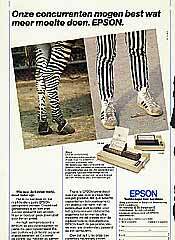 (4) 1991 - Black & White & Colour copiers. 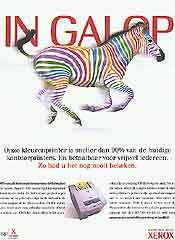 (5) 2002 - At a gallop. 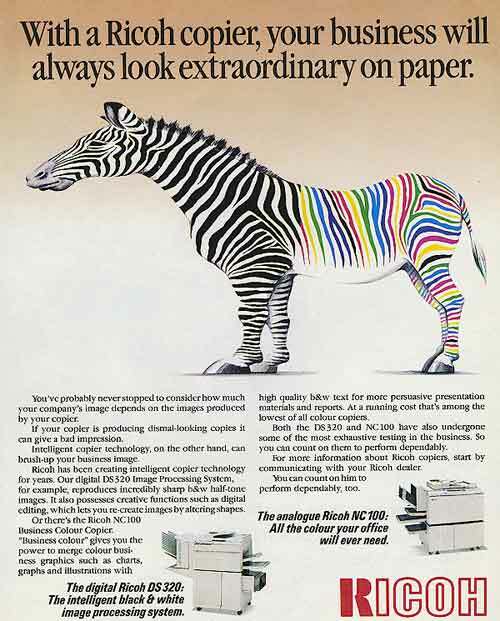 Our colour printer is faster than .... (6) 2000 - Paper that's earned its stripes. Alternating black & white stripes are the main characteristic of the kind. 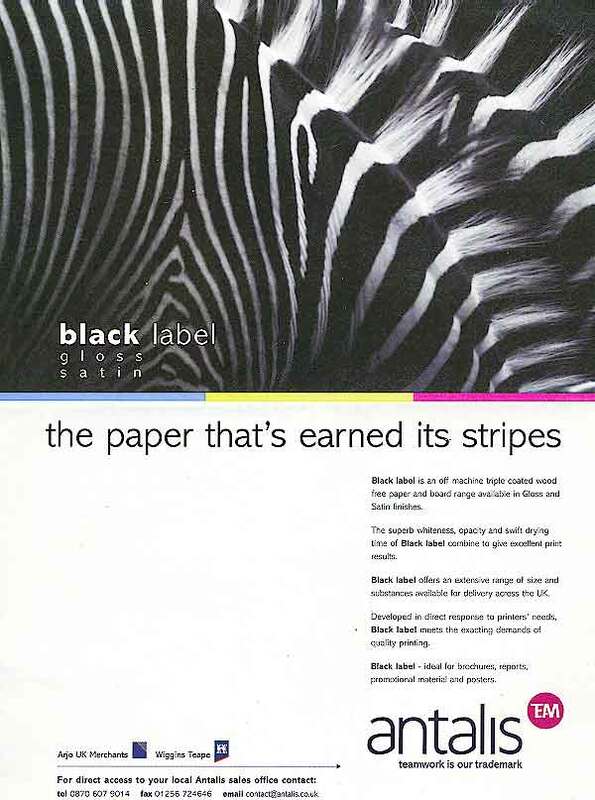 That's why a Zebra was used in ad 6 for the paper that's earned its stripes . 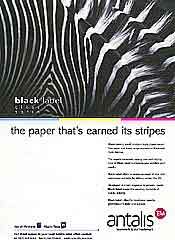 Considering the name of the paper - Black label - a black panter (meaning professionalism, quality) was perhaps a better choice. 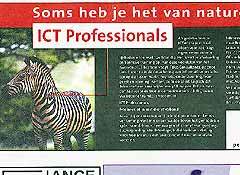 Our next example is a bit peculiar because I was surprised to find a Zebra with the caption Stripes don't suit everyone . I would rather expect an edited picture of another species with ill fitting stripes (e.g. the elephant of ad 14). Apart from that, I consider it the best episode of a series of adverts about this banking company. 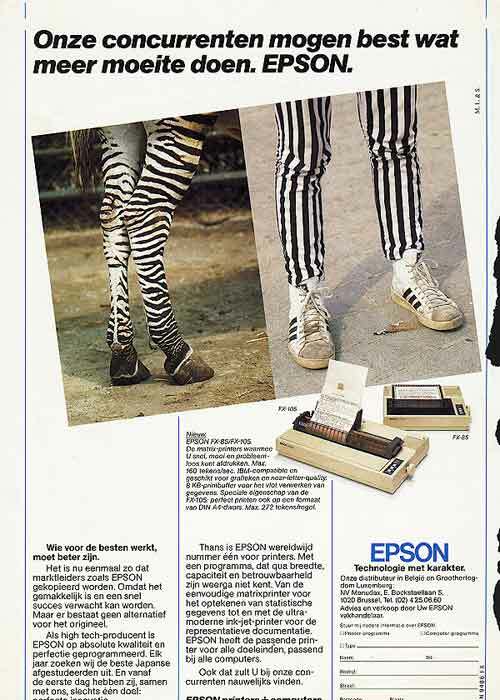 Other captions were Full-bodied enthusiasm and A nose for opportunity each with a Zebra. 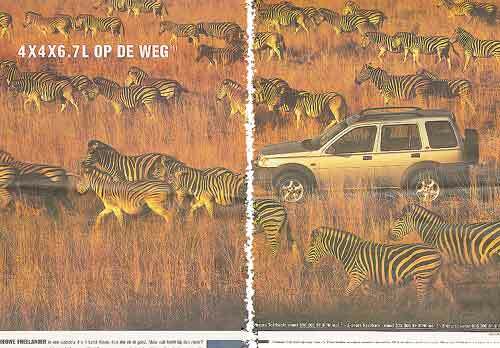 Some copywriters prefer to use a Tiger when they need stripes (see Bigger cats ad 16). (7) 2001 - Stripes don't suit everyone - banking group. (8) 2003 - Different viewpoints make for a broader view. 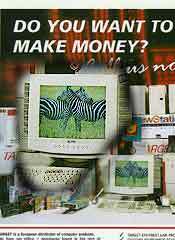 (9) 1998 - Want to make money? 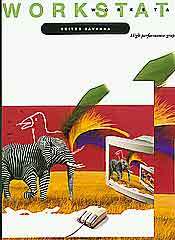 The Zebras of advertisement 8 were published several times. Sometimes the image was mirrorred or differently cropped. The text in the red box varied also. First it said Different viewpoints make for a broader view ... and later we read Strategic partnerships are broadening the horizon ... . I wouldn't pay for the opening lines of the accompanying text. A real partnership means: to discover together nice perspectives and to have an open mind for new opportunities. This is a truth not valid in the animal kingdom only. ... . Very weak. It sounds like a last minute tweak. The bureau was probably desperately looking for a picture suggesting at least an atom of partnership and the poor copywriter had no choice but to comply. 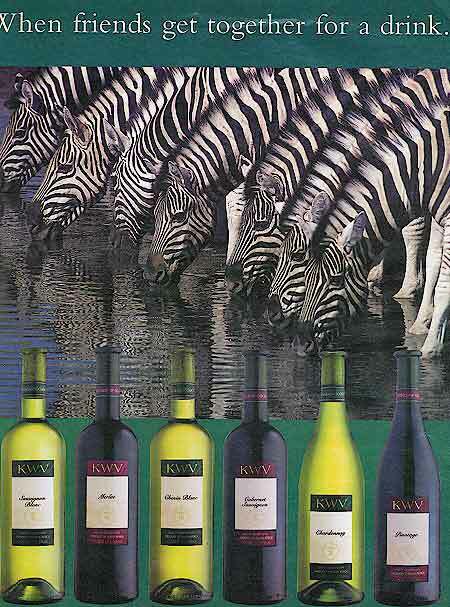 It is obvious that the Zebra isn't important in this case. It is the pose that counts. Any species would do. Take a look at advertisement 18 for a similar approach. Our next examples would probably work equally well with other animals showing similar behaviour. Let's take a closer look and try to find the reason why a particular image was chosen. 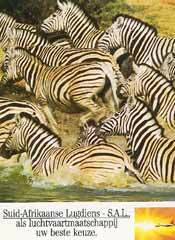 Zebras are living in herds. Often the herds are mixed thus giving plenty of openings towards partnership and friendship and the like but I've still to find the first advert taking this approach. There are times in the life of a herd when not all noses are pointing in the same direction. Advert 10 captures such a moment to stress the feeling of anxiety towards the future. 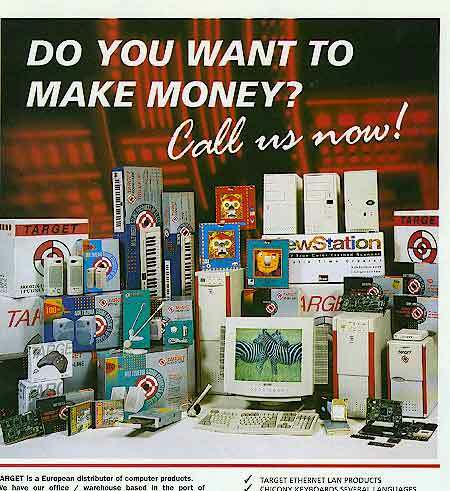 But this company can help. We have a French and a Dutch version and both texts aren't entirely equivalent. In French there is Only one solution . The text in Dutch says There is only one way out: ahead . 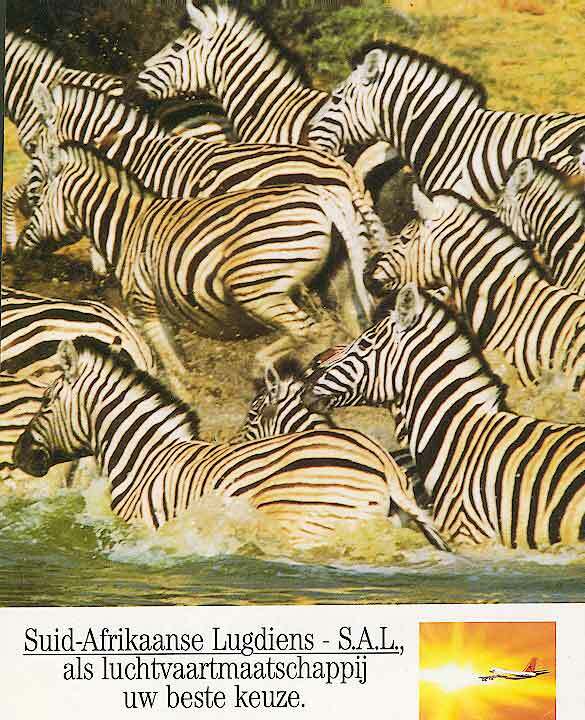 The Zebras of ads 11 and 12 stand for South-Africa. A country is often represented by a typical species living within its borders. 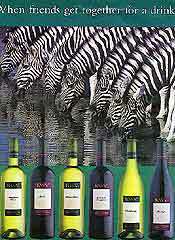 Zebras are used for trade fairs in Cape Town and holidays in Kenia, Tanzania as well. Examples with other species online: elephant = South Africa (see Elephant); tiger = Asia (see Bigger cats). I have already explained in the chapter about Elephants how they stand for the landscape and also for escape, discovery, adventure. 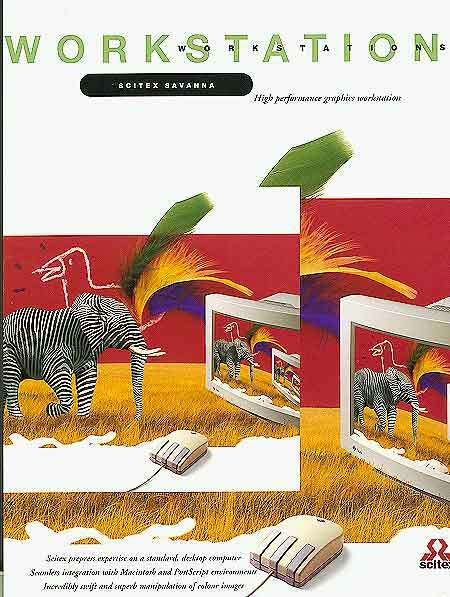 We find the landscape-line of thinking in example 14 where we have both, Elephant and Zebra, in an advert for Savanna workstations. A pension plan will bring you a better life in the future. 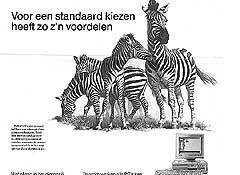 The plan is announced with a picture of Zebras drinking on a well. 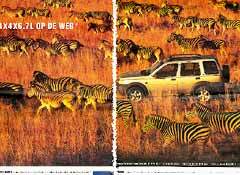 We recognize the feeling of ad 12 (friends, good atmosphere) but also the notion of safari and the luxury of a holiday. And then we have the usual guesswork. Advert 13 is about longtime relationship with customers, no-nonsense approach and high productivity and we are shown a picture of mother with child. This kind of image is usually used to convey protection, safety, care (e.g. Penguin, Bear). 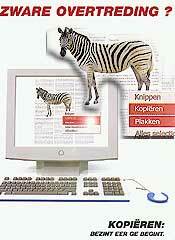 Why this image, why a Zebra? 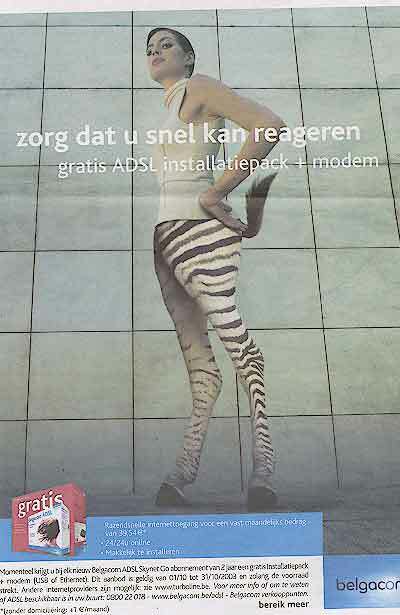 Advert 15 about the ADSL internet connection is part of a series where several wild animal species are shown. 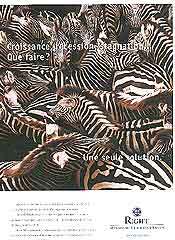 The Zebra could have been chosen for the notion of freedom or because they were running out of species. (Read about the Cat version). 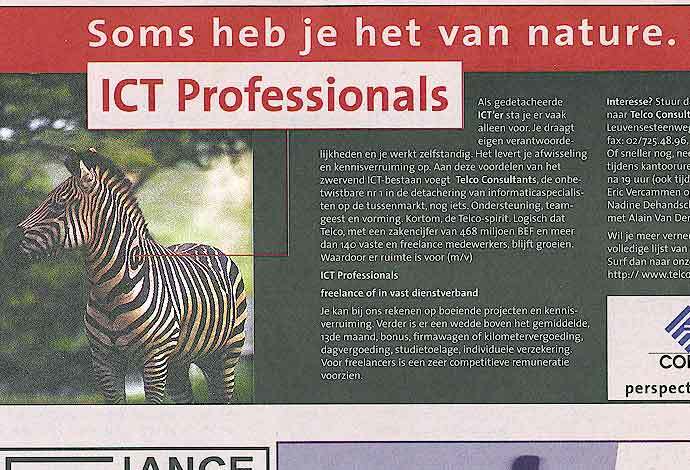 The next example (16) is also part of a group of similar advertisements for ICT professionals. Several species are shown and in most cases I can only guess why a specific animal was taken. There is an advantage in choosing for a standard. , says advert 18. 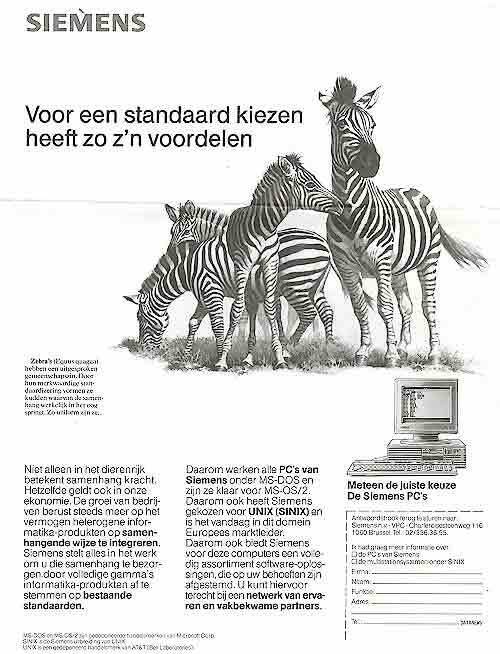 This clearly is not only true for the Personal Computer in 1990, but also for the way adverts were built. Standard procedure is to give some facts about the animal (which advert 8 didn't supply) and then make a link with the product. 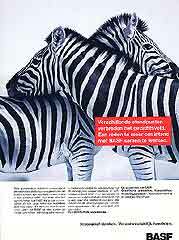 So we can actually learn that Zebras (Equus quagga) have a strong community spirit. They live in herds with an eye-catching coherence because of their remarkable standardizing. This is uniformity... . The reader must be ready now for the connecting thought: The animal kingdom is not the only place where coherence means power. The same holds true in our economy. Rings a bell? You'll find examples of the same procedure in several sections (e.g. Horses ad 3, Penguin ad 1). The species isn't important as long as it's not solitary living.